Challenge your body with these four Crab Walk variations. They will strengthen your core, build firm glutes and make your legs stronger. The Crab Walk is surprisingly effective because it’s a compound exercise that works more than one muscle group. Try these variations and target specific muscles with and without resistance equipment. Works: triceps, shoulders, back, abs, hamstrings, upper legs, quadriceps. Sit on the floor with your feet comfortably apart and your palms on the ground behind your hips. Engage your abdominal muscles and press your feet and palms to the ground to raise your rear end off of the floor. Using your left foot and your right hand, walk one step forward. Repeat this action on the other side. Practice this movement moving forward and backward. You will become faster and more coordinated with time. To make it more challenging, kick up one foot and then the other. Perform Prone Crab Walk from a face-down position. A prone crab walk begins from a pushup position. Walk your left hand and left foot out and to the left at the same time. Walk your right hand and right foot to the left at the same time. Repeat this sequence and retrace your steps moving to the right. A sumo-style crab walk will target your inner thighs while challenging your quadriceps. Do this variation of the crab walk from a standing position. Assume a wide stance with your toes facing out and your knees bent. Maintaining your wide stance, walk forward one step at a time for as far as the space where you are working will allow. Turn around and return to your starting position. By keeping your toes turned out, you will keep your inner thighs engaged and working during the walk. You will work your quadriceps by holding them in a bent-knee, static position known as an isometric hold. A basic crab walk starts from a standing position with your toes facing forward. Step out to the right with your right foot and then bring your left foot in. Repeat this sequence and then reverse. Perform the traditional crab walk with bent knees in a squat position, or make it simpler by straightening your legs. 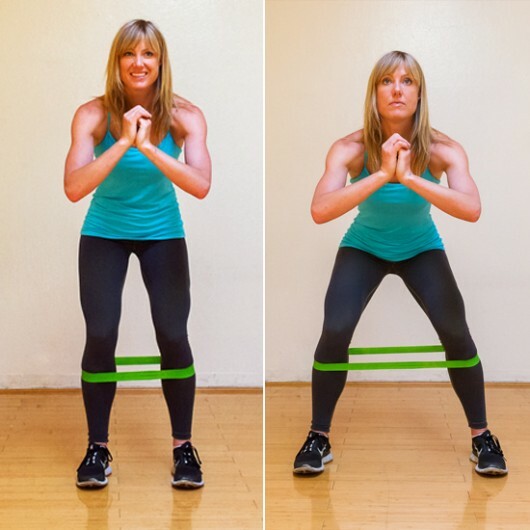 Tip: Use a resistance band around your ankles to make the exercise more intense.